You can easily prevent tooth decay by brushing and flossing your teeth regularly, seeing Dr. Cross for teeth cleaning and checkups, and avoiding foods that are high in sugar. The combination of bacteria and food causes tooth decay. A clear, sticky substance called plaque that contains bacteria is always forming on your teeth and gums. As the bacteria feed on the sugars in the food you eat, they make acids. The acids attack the teeth. Over a period of time, these acids destroy tooth enamel, resulting in tooth decay. You don't brush your teeth twice a day, in the morning and before bedtime. You don't floss your teeth each day. You eat foods with a lot of sugar in them. The longer a sugary food stays on your teeth, the more the bacteria feed and make acids. Sticky sweets and sugary foods, such as raisins, sugar-coated cereal, cake, cookies, caramel, and taffy, cause the most damage. Lack of fluoride in the public water supply also makes tooth decay more likely. You can pass the bacteria that cause tooth decay to your baby. This can happen when you share spoons, forks, and other utensils with babies. The saliva you leave on the utensil contains the bacteria. Sometimes kissing can also transfer saliva and bacteria. You can help prevent tooth decay in your child by making sure that your family practices good dental health habits. Tooth decay usually happens slowly over a period of months or years. Decay begins when bacteria in your mouth increase during the first 20 to 30 minutes after you eat. The bacteria make acids, which eat away at the hard mineral layers of the tooth. A hole (cavity) forms when the acids cause more damage than the tooth can repair. A tooth has an outer layer (enamel), a middle layer (dentin), and a center (pulp). The more layers that are affected by decay, the worse the damage. When tooth decay is mild, the area of decay is small and has not pierced the tooth surface. You can sometimes stop the decay with improved care, such as having your dentist apply fluoride to your teeth. 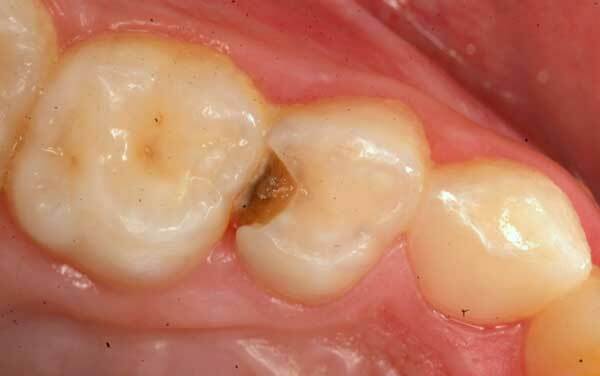 When tooth decay gets worse, a cavity forms. You will need a filling to stop the decay and prevent more damage. If the decay reaches the pulp, the tooth will die, because the pulp contains nerves and blood vessels that supply the tooth. After a decayed tooth dies, an abscess may form in the bone at the end of the root. For more information, see the topic Abscessed Tooth. Pit and fissure cavities, which form in the deep pits and grooves on the chewing and biting surfaces of the back teeth. 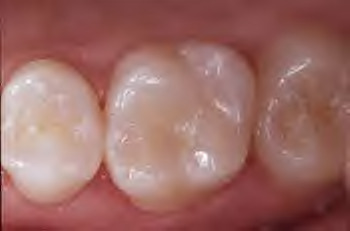 Smooth-surface cavities, which form on the sides of teeth, including between the teeth. Root cavities, which form on the root and can extend below the gum line. Root decay is less common than decay in other parts of the tooth. But root decay is more likely to damage the tooth pulp. Recurrent or secondary cavities, which form where you already had a cavity. Untreated tooth decay causes more severe problems and can lead to gum disease. For more information, see the topic Gum Disease. Your saliva helps prevent tooth decay. It reduces acid damage to a tooth by washing away sticky, sugary foods that feed bacteria. The minerals in saliva also can help repair the tooth. Tooth decay is a common problem in all age groups. Tooth decay is the most common long-lasting childhood disease. It is 5 times more common than asthma, and nearly 20% of children between 2 and 4 years of age have cavities. By age 17, almost 80 percent of young people have had a cavity. More than two-thirds of adults age 35 to 44 years have lost at least one permanent tooth to cavities. About 50% of adults age 75 and older who have one or more of their own teeth have had decay in their roots.